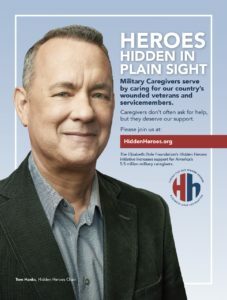 Acclaimed actor, filmmaker and our Hidden Heroes Campaign Chair Tom Hanks brings vital attention to service of military caregivers in a new public service announcement. Hanks appears in the PSA with military caregiver Jessica Allen, her husband Army Staff Sergeant Chaz Allen and their two daughters, Ryann and Deryn. Broadcast spots have been distributed to television stations across the country. A print version will appear in national magazines such as Redbook, Essence and Town & Country, starting in October.